Cornbread Crusted Squash Casserole - so delicious!!! Easy homemade squash casserole topped with a cheddar and cornbread crust. Everyone went back for seconds. Onion, Squash, pimentos, bacon, cornbread and cheddar cheese. Can make ahead of time and refrigerate until ready to bake. 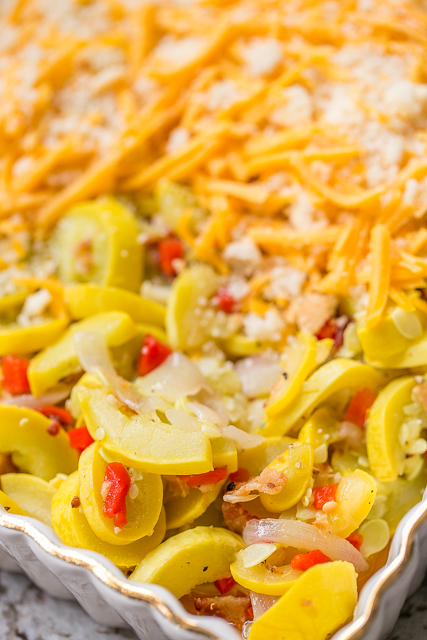 Great side dish recipe for potlucks and cookouts. 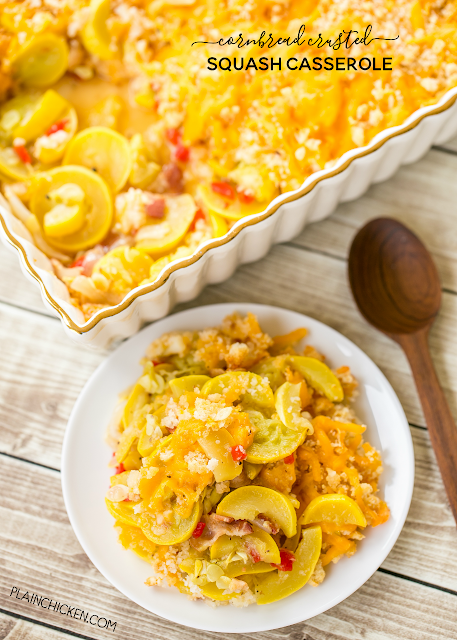 Squash Casseroles are one of our favorites. 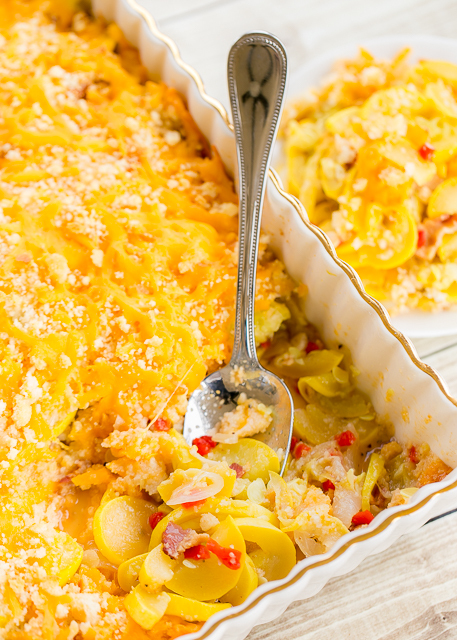 This squash casserole is over the top delicious with its yummy, cheesy cornbread crust! That's right - cheese AND cornbread. OMG! Not only does this have cheese and cornbread, it also has BACON!! You can't go wrong with a veggie side dish with bacon. Everything is better with bacon. Am I right?!?!?! For the cornbread, you can use a packet/box of cornbread mix or use some of your leftover homemade cornbread. I have a couple of great homemade cornbread recipes on the blog if you want to use homemade. I just used a package of buttermilk cornbread mix since I had one in the pantry. This Cornbread Crusted Squash Casserole recipes makes a ton. It would be great for a cookout, potluck and your upcoming Memorial Day celebration. You can assemble the casserole the day before serving and refrigerate it overnight. I love make ahead dishes! Especially for potlucks and parties. In a large skillet, melt 4 Tbsp of butter. Add onion and cook until tender. Add squash, cover and simmer for about 15 minutes. Stir in pimentos and cooked bacon. Season with salt and pepper. Pour squash mixture into prepared baking pan. Combine crumbled cornbread and cheese. Sprinkle over squash mixture. Dot with remaining 2 Tbsp of butter. Bake, uncovered, for 20 to 30 minutes, or until bubbly and top is golden brown.